Ratings of health care were similar across adults with and without health problems, but higher-income adults were more likely than low-income adults, and white, non-Hispanic adults were more likely than adults of other racial/ethnic backgrounds to give high ratings. Most adults named either care providers or care setting as the most important factor in rating their health care; only one in five adults said the care they received was the most important. Reducing costs, improving quality, and increasing value are among the most pressing needs in health care today (Bauchner and Fontanarosa 2016; Obama 2016). Strategies such as value-based insurance design, patient-centered care, and shared decisionmaking seek to reduce costs and improve quality by linking provider payments to quality of care or by giving patients a say in their experience of care (CMS 2015, 2017; Epstein et al. 2010).1 Despite this emphasis on quality for patients, relatively little is known about how patients themselves assess their health care, or what factors they consider in assessing their care. Current evidence suggests that health care experts and medical professionals often think of health care quality in terms of technical measures, but patients often associate quality with the â€œsoft skillsâ€� of their providers (AP-NORC 2014; Lynn, McKethan, and Jha 2015; Quincy 2014, 2016). Consumer surveys, such as the Consumer Assessment of Healthcare Providers and Systems (CAHPS), usually focus on specific aspects of the patient experience in one type of setting or circumstance (e.g., hospital, clinic, Medicare, Medicaid, or commercial health insurance plan) to identify areas for improvement. In this brief, we explore patientsâ€™ overall assessments of their own health care along different dimensions as well as the factors underlying those assessments. care received: the health care services, tests, and treatments that they received. Participants were also given the option to write in a response. We examine patientsâ€™ ratings of their health care and the factors underlying those ratings. The sample in this analysis is limited to 7,233 adults who received health care in the past 12 months.4 Like all survey data, these are self-reported assessments and do not necessarily reflect clinical outcomes or appropriate care delivery. Most adults gave high ratings of their health care; more than 30 percent rated their health care a 9 or 10, where 10 is the best care possible. Nonelderly adults tended to rate their health care favorably no matter what version of the question they received (figure 1). Across all three versions of the health care question, the median response category was a rating of 7â€“8 on the 0 to 10 scale, with more than 30 percent of respondents rating their health care a 9 or 10. Another 20 percent of respondents gave ratings in the middle of the scale, at 5 or 6. Relatively few adults (less than 10 percent) gave ratings from 0 to 4. 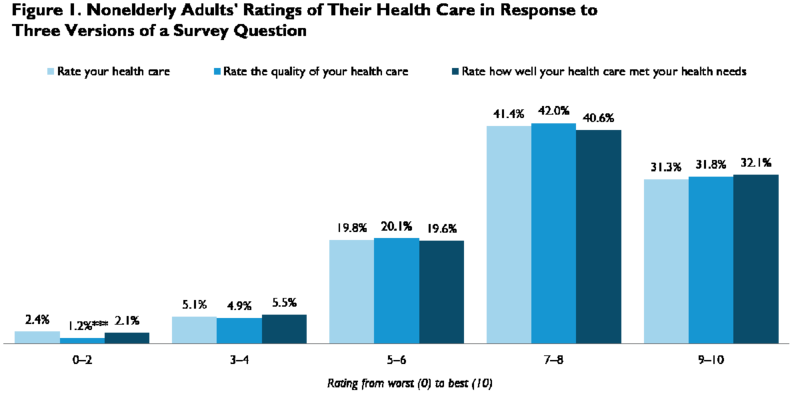 Adults who gave ratings below the median category of 7â€“8 tended to be younger, Hispanic or nonwhite, and lower-income, as shown in Bart and Long (2017). 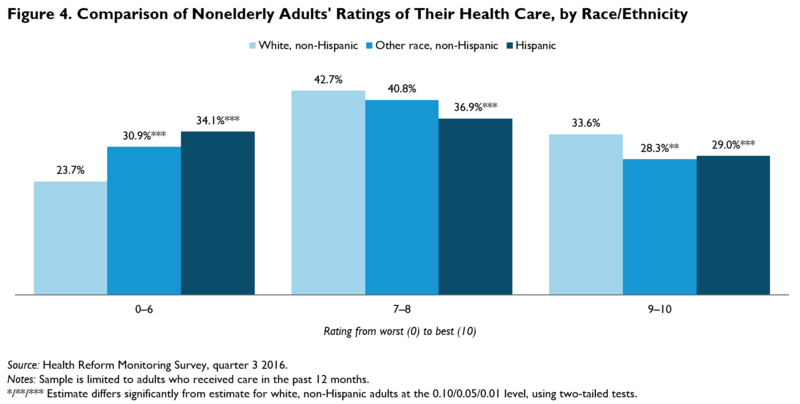 Ratings across the three versions of the health care rating question remained similar when comparing adults with and without health problems, adults at different income levels, and adults of different racial/ethnic backgrounds (data not shown). As a result, we focus on the overall rating of health care that combines the three versions of the question for the rest of this brief. 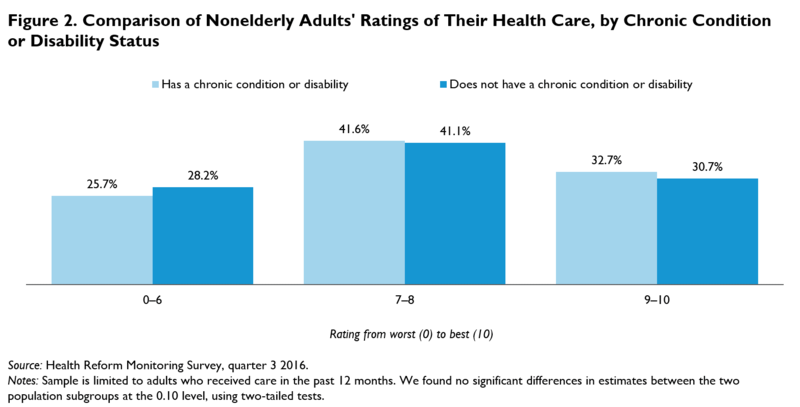 Adults with and without a chronic condition or disability did not differ significantly in how they rated their health care (figure 2). Consistent with the overall population, the median response category among adults with and without health problems was a rating of 7â€“8; roughly 30 percent of each group rated their health care a 9 or 10. 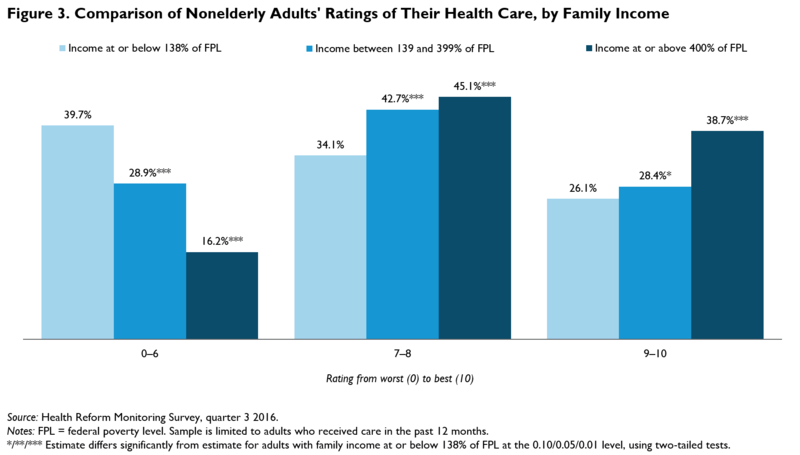 By contrast, ratings of health care differed significantly across family income groups and across racial and ethnic groups, although the median rating remained high. High-income adults were more likely than lower-income adults to report ratings of 9 or 10 (figure 3), and white, non-Hispanic adults were more likely than other non-Hispanic adults or Hispanic adults to report ratings of 9 or 10 (figure 4). Most adults named either care providers or care setting as the most important factor in rating their health care. 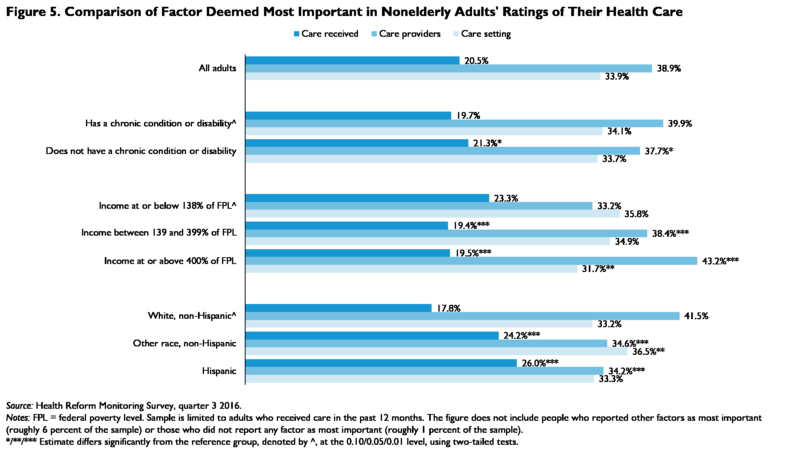 The factors considered most important in rating health care varied across population subgroups. Notably, higher-income adults and white, non-Hispanic adults were more likely than other adults to report care providers as the most important factor, and low-income adults and racial/ethnic minorities were more likely to report the care received. Overall, adults rate their health care favorably, with less than one in ten adults giving a rating below 5 on a 0 to 10 scale. 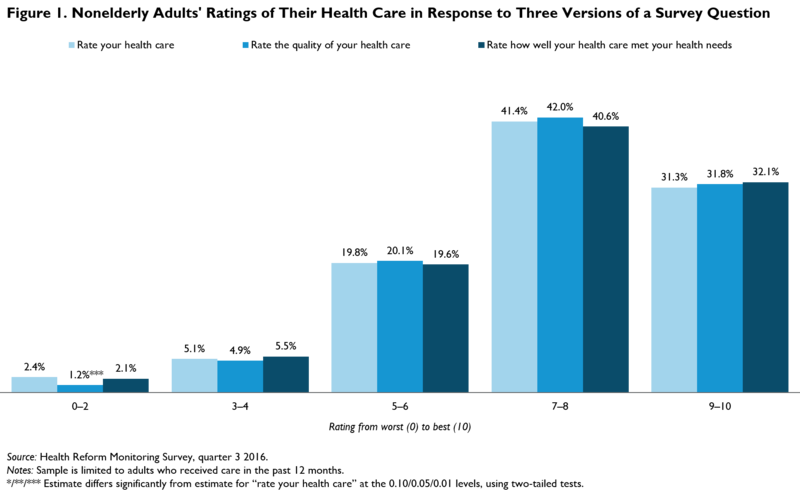 Relatively high ratings were reported across the overall population and across population subgroups, although higher-income adults were more likely to give high ratings (9 or 10) than low-income adults, and white, non-Hispanic adults were more likely to give high ratings than adults of other racial/ethnic backgrounds. Adults consistently gave favorable ratings, whether they were asked to rate their health care, the quality of their health care, or how well their health care met their health needs. Most adults (over 70 percent) considered either their care setting or their care providers to be the most important factor in the rating of their health care; roughly 20 percent said the care they received was the most important factor. This highlights a disconnect between medical professionalsâ€™ and patientsâ€™ perceptions of care quality. Patients consider the patient-provider setting and relationship to be the most important aspects; however, current evidence suggests that health care experts and medical professionals often consider the care provided most important in assessing quality. With an increasing focus on reforms that reward quality of care and approach care with a more patient-centered perspective, it is important to recognize that care setting and the patient-provider relationship are critical to patientsâ€™ own assessment of their health care. AHRQ (Agency for Healthcare Research and Quality). 2012. CAHPS Health Plan Survey 5.0. Rockville, MD: AHRQ. AP-NORC (Associated Pressâ€“NORC Center for Public Affairs Research). 2014. Finding Quality Doctors: How Americans Evaluate Provider Quality in the United States: Research Highlights. Chicago: AP-NORC. Bart, Lea, and Sharon K. Long. 2017. “QuickTake: Many Patients Who Give Low Ratings to Their Health Care Are Disadvantaged.” Washington, DC: Urban Institute. Bauchner, Howard, and Phil B. Fontanarosa. 2016. “The Future of US Health Care Policy.” JAMA 315 (13): 1339–40. CMS (Centers for Medicare & Medicaid Services). 2015. “Hospital Value-Based Purchasing.” Baltimore: CMS. ———. 2017. “The Quality Payment Program Overview Fact Sheet.” Baltimore: CMS. Epstein, Ronald M. Kevin Fiscella, Cara S. Lesser, and Kurt C. Stange. 2010. “Why the Nation Needs a Policy Push on Patient-Centered Health Care” Health Affairs 29 (8): 1489–95. Lynn, Joanne, Aaron McKethan, and Ashish K. Jha. 2015. “Value-Based Payments Require Valuing What Matters to Patients.” JAMA 314 (14): 1445–46. Obama, Barack. 2016. “United States Health Care Reform: Progress to Date and Next Steps.” JAMA 316 (5): 525–32. Quincy, Lynn. 2014. Engaging Consumers on Health Care Cost and Value Issues. New York: Consumers Union. ———. 2016. “A Call to Action: Addressing Research Gaps to Provide Better Healthcare Value for Consumers.” Washington, DC: Consumers Union Healthcare Value Hub. Sharon K. Long is a senior fellow and Lea Bart is a research assistant with the Urban Institute's Health Policy Center. The authors thank Genevieve Kenney and Stephen Zuckerman for their comments on an earlier draft.